Leading scholars at Harvard tell their stories in the Experience series. Nitin Nohria graduated from the Indian Institute of Technology in Mumbai in 1984 with a bachelor’s of technology in chemical engineering, a degree he had little interest in using. From there, he went on to the Massachusetts Institute of Technology’s Sloan School of Management, where he envisioned a career as an entrepreneur before realizing that teaching was his true passion. After graduating from MIT in 1988 with a Ph.D. in management, Nohria joined the faculty of Harvard Business School, where he soon developed a reputation as a consensus builder and strong leader. A scholar of leadership and organizational change, Nohria has zeroed in on the nuances of human motivation, the theory and practice of leadership, corporate transformation and accountability, sustainable economic and human performance, and the strategic and organizational challenges of globalization. After 22 years as an award-winning professor, he was chosen by President Drew Faust in 2010 to serve as the Business School’s 10th dean. Now, at a time of great change for business and business education, Nohria has earned accolades for his robust efforts as dean to reconsider and refine the MBA curriculum to include more experiential learning, to emphasize “competence and character,” to expand Harvard’s global reach, and to confront long-standing challenges such as cultural barriers for women faculty and students at the School. Q: Tell me a little bit about your life growing up in India. A: Three moments in my schooling stand out in particular. The first was in second grade. There was an essay competition to be one of the few people who would be chosen to go see the lunar landing. I was 7 years old. There was no television in Indian homes; you had to go to the national television station to see it. A few schoolchildren and teachers from some of the top schools were invited to participate in this contest, and I was lucky enough to be selected. It was one of the landmark moments in my life. It was the sense of the pioneering spirit, and it gave me this fascination with people who are pioneers. The second moment was with my eighth-grade English teacher, who was probably the single most influential person in my life. We used to have these textbooks that were designed by the government called Radiant Readers. This teacher saw that I was bored and had outgrown the Radiant Reader. He kept me one day after class. He said, “You know, I think you should read more than this Radiant Reader and so I want you to start reading some other authors.” The first book I remember reading was Pearl S. Buck’s “The Good Earth.” Then I read Steinbeck. In that one year, I must have read 20 Nobel Prize-winning authors. And all of a sudden, the world changed. From that day onwards, I felt like I could educate myself. It was just the difference between feeling like I had to be educated by teachers to feeling like I could educate myself, and just being unafraid to read anything. That was a very, very important influence on me. The third moment was in 10th grade. The school had an award for the best “all-rounder,” which is an Indian phrase meaning someone who’s good at everything — sports, academics. I’d aspired to that goal, and I got the title that I had aspired to. Q: How did you make your way to the United States? A: Then I went to IIT Bombay to study chemical engineering. My dream was to go to Oxford or Cambridge, which is ironic because IIT Bombay was probably harder to get into. I didn’t love being a chemical engineer, and therefore, I ended up being no good at it. My entire five years in chemical engineering were spent waiting to get out of Dodge. Two-thirds of my graduating class went to the United States, 99 percent of them to graduate school in engineering. I was very clear that I didn’t want to go to graduate school in engineering. So I ended up applying to graduate schools of business. My great hope was to join an MBA program. Frankly, I had no desire to ever be a doctoral student. If someone had told me when I was graduating college that one day I’d be a professor, I would have died laughing. Anybody who knew me would have laughed even harder. Nobody would have envisioned me as a professor, nor could I have. I applied to Ph.D. programs almost entirely because they offered scholarships. So I must have applied to half a dozen MBA programs and half a dozen Ph.D. programs. One of the happiest days of my life was getting that letter from MIT which said, “You’ve been admitted to the doctoral program.” The second paragraph [read] “and you have a fellowship to come study.” I am extraordinarily grateful for this American tradition of philanthropy that allows people to have access to education, because that was the single thing that changed my life. Then I came to MIT, and it was the first time I had ever traveled outside of my country. I started off thinking I would study finance. I didn’t even realize that leadership and organizational behavior was a field of study, yet I ended up taking classes in those areas and finally found the thing that I fell in love with. Q: When I think of chemical engineering, I think of precision-based thinking. So then to shift to management and human dynamics — these are fields that are anything but precise. A: Yes, that’s what was so surprising. Really, I started off thinking that I would study finance because I knew I didn’t want to do engineering, but I was reasonably good at math. I liked that kind of analytic thinking. But this is maybe my eighth-grade teacher’s enduring influence, the deep love for things that were not as precise — literature, philosophy. That influence remained very powerful. And when I started to read about sociology and psychology and leadership and organizations, it was somewhere in between. Social science felt in between the engineering and hard sciences that I’d studied. But more than anything, it just spoke to me. I also wonder how much of it was just the influence of my father. I lived in a household in which my father talked a lot about his business challenges. My father was not interested in sports. We ended up talking a lot about the challenges that he faced in business and how to think about them. We talked a lot about philosophy. So those were the things that I learned from my father. Maybe it’s all of that that finally came together. It was the best choice I ever made, because there was a rational side of me that kept saying, “Why are you doing this? Why don’t you just stay in finance, especially at MIT?” This was a time when there were Nobel Prize winners in that group: [Franco] Modigliani and Fischer Black had recently won the Nobel Prize. So there had been really important work, and I was in that department, and I had the opportunity to work with all these people. Yet I was more drawn to organizational behavior, which had a great tradition at MIT as well, some very famous thinkers — [Douglas] McGregor, Ed[gar] Schein. Q: Was your interest in business a result of your father’s influence? A: I think that certainly my father had a very large influence on my interest in business. But more than that, I also had a very visceral experience with business. I used to travel with my father very often, and I saw what business could do. He was running an electrical equipment company. This was a time when India was getting electrified, so the vast majority of the country had no electricity, and he was building the generators, the transformers, the equipment that would help in the electrification of the country. I still remember going to visit a factory in a place called Nashik, which was just outside of Bombay. So we’d go to these places — Nashik was a great example — where there was nothing, and my father, his company, built the first factory. Then you go to these places again five years later and where there was a factory, there were 10 factories. And then you go another 10 years later and there was a whole city. So the power of business to generate economic prosperity — I remember there was a 10th-year anniversary of the Nashik factory that I had the privilege of going with my father to see the first year when it was actually started. We were sitting at the lunch table, and it was his common practice to sit at the regular lunch table with workers. I was sitting next to a worker, and he was describing how much this factory had changed his life — how he had gotten employment, his kids had gone to college, there were now hospitals. So I had this very visceral sense of business being a noble thing and that the impact it had on society was very positive. It didn’t just feel like a choice that I was making because it was a conservative choice or a choice that would generate employment or something. It just felt like a way to live your life where you could do something with your life that was worthy. Q: Did your father or mother offer any advice to you in those days that stayed with you? A: My father always used to say that there must be two things that you should always do in life. He said you should find something that you love doing. And you should find something that makes you feel like you’re doing better for society. That was very important to his own sense of life — living a life in which your life was in some ways giving back to society or you felt like you were making a positive difference in society. That was a deeply important value for him. His view was that there’s no particular way in which you should choose to do it. Find something that you love, but find something that also makes you feel that you’re making a positive difference on society. Q: When you first came to the United States and arrived at MIT, did you have any preconceived notions about what Cambridge or the U.S. was like? A: There was this wonderful graduate student who was about 10 years older than me. I was among the youngest people in the graduate program at MIT. She was very concerned, almost like quasi-maternally concerned, about whether this young kid who had just dropped off the boat from India was doing OK or not. I remember about four weeks in, she sat down and she said to me, “Are you having culture shock?” I said, “Yeah, I’m in culture shock.” She says, “In what way?” And I said, “I didn’t realize I had come to a village.” Because I was shocked that you couldn’t go out after 10 p.m. and get dinner in Cambridge! In Bombay, after 10 p.m. is when you started to go out and it was a big city even then. Now it’s 20 million, but when I left it was probably 10, 12 million. Boston felt very provincial. On the other hand, the academic environment at MIT was the most freeing — you suddenly felt like there was no limit to what you could imagine, what you could think, what you could do. I had this simultaneous sense of, on the one hand, being in a small place, but on the other hand, being in a limitless place intellectually. What was striking is that nobody said that just because you’re a graduate student, you’re supposed to think small thoughts and you have to wait until you get tenure to think big thoughts. In India, you almost always felt that you had to find your place. It was a very hierarchical society, and when you were young, you were never supposed to challenge a professor. Here, to suddenly be liberated to imagine whatever you wanted to imagine for yourself, to be encouraged to sit in seminars — your right to ask a question, if you asked an intelligent question, was the same as anybody else’s right to ask an intelligent question. To constantly be challenged by your professors, I had this extraordinary sense of liberation intellectually, which was exhilarating. There’s no other word that can describe it. It was just exhilarating. Of course, I did have to get over the cold. Q: Tell me about your transition to teaching. A: My first summer after my first year, I thought I wanted to become an entrepreneur. I negotiated a license with a company in Ireland to make electrical tapes in India. We had this whole deal: I was going to graduate, I was going to go back and start this company. But by my second summer, it was very clear that I wanted to be an academic. I had started to write my first set of papers, and completed my general exam. Q: Did you have any moments of serious self-doubt about whether you could distinguish yourself as a graduate student or as a young professor at HBS, moments where you said to yourself, what am I doing here? For some reason, that felt right. Any activity that you engage in which is entrepreneurial, which is what I think inherently being an academic is, will always have some moment of doubt. Yes, there have been moments of doubts throughout my career. But they never felt overwhelming. They always just felt like — that doubt is just inherent in the nature of any activity in which a lot depends upon you. Q: Who were some of your early mentors? You mentioned your eighth-grade teacher. Are there others and what did you take away from them? A: I had this very eclectic group of advisers at MIT. I had Mike Piore, who was an economist; I had Don Lessard, who studied international finance; Eleanor Westney, who was a historian of Japan and a sociologist; Mel Horwitch, who was a historian of technology and did technology strategy; and John Van Maanen, who was an anthropologist and used to write ethnographies. None of the five of them would necessarily have ever gotten into a room to talk to each other, but they all talked to me and through me. And each one of them I learned very, very powerful things from. From Eleanor Westney I learned a historical sensibility, which has been important to my research as time has unfolded. From Mel Horwitch I continue to find an interest in how technology plays out in organizational life, and that was very important. John Van Maanen gave me kind of a sensibility about methods, of qualitative data. Even though I had grown up doing quantitative studies, he’s the one who showed me how to do qualitative research, and that has become very important to the research that I’ve done. And Don Lessard was the person who gave me the courage to say, even though you started off in finance, you don’t have to do finance at MIT. Having a finance professor say it’s OK to do something else was really important. And so each of them I am very grateful to, and they remain good friends. Equally, when I came to Harvard Business School, I got very, very lucky. Mentors have played a very powerful role in my life. I think that we all underestimate sometimes how powerful these people are in terms of shaping your life. The first person whom I ended up working very closely with at Harvard Business School was Bob Eccles. He was chairman of the organizational behavior department when I was recruited. I wrote my first book with him. I went out and did my first field research at Harvard Business School with him. He taught me how to teach. I became godparent to his son, so we became great family friends. It was a relationship that ended up being profoundly important not just professionally, but personally. Another colleague of ours, Jim Cash, who ran our MBA program, helped me get into my first field sites in terms of writing cases. And John McArthur, who was dean at the time, I still treasure. I don’t know what motivated him to do it, but in my third year as an assistant professor, I had written a paper on the importance of taking action as a leader and how important it was to be willing to act and to not be paralyzed by the permanent uncertainty that exists before you take action, because you never know 100 percent whether you’re going to take the right course of action or not. I still have that letter. Because the dean of Harvard Business School — I mean, why would [he] even know who a third-year assistant professor is? Somehow I always had the feeling at Harvard Business School that people were looking out for my welfare. I don’t know why. I just felt surrounded by people, from the dean on down, who I felt were deeply interested in my professional and personal development and to have me succeed. That has been why, in some ways, I love this School, because I felt the School loved me in the deepest sense of that word. I never felt that I had a professional relationship with the School; I really felt that I had this caring relationship with the School. Q: Is there some piece of scholarship or work that you’re most proud of? A: I don’t know whether it’s always true for people, but I feel happiest about the first book that I ever wrote, and that was with Bob [Eccles]. It was a book that we wrote called “Beyond the Hype: Rediscovering the Essence of Management.” There was a lot of talk around the time that he and I were writing this book that there was a revolution that was taking place in organizational life, and everything was, you know, hierarchy was being destroyed, and networks were going to replace hierarchies. The old order was no longer valid, and some new order was being created. There’s always this hype that animates the literature about how the world is changing and we are living through an era in which the old order will be destroyed. The heart of management is that even this rhetoric plays its purpose; it provides the animating energy. Business is a field in which leadership is this process of continuous renewal. It’s not like everything can be new. But yet the rhetoric of new is important, because it’s the way in which you engage and motivate and mobilize. So we talked about how rhetoric and action and identity were the three core things that seemed to be at play underneath all of this hype and were the constant around which leadership and management were permanently engaged, even though it always had to take a kind of fresh guise. I still think of that as being the best piece of work I’ve ever done. Now that I’m actually in a leadership job, the core ideas from that book remain. You just experience them every day. Q: Looking back, are there any regrets or missteps along the way? For many, many years, I used to wonder whether that was just a misstep, that I should have curbed my own eclectic impulses and been more focused in my scholarship. And then maybe three or four years after I got tenure, someone gave me this great essay by Isaiah Berlin called “The Hedgehog and the Fox.” It’s about different intellectual styles, and it talks about how there are some people who are like a hedgehog, they’re very deep, and there are other people who are like the fox, and you kind of flit from thing to thing. It’s very hard to turn a fox into a hedgehog or a hedgehog into a fox. Maybe it was just an easy rationalization, but I came to think of myself as an intellectual fox, and I was much happier. I think this is a tension that many academics face — what kind of scholarly life do you want to have for yourself? Q: I understand that you’re the first dean in 30 years to live in the Dean’s residence. Could you talk a little bit about that decision? How has it worked out? A: It’s worked out great. It was almost done on instinct more than anything else. We are a residential campus, which is a very distinctive feature. We’re the only graduate business school that is almost a fully residential campus. I had this sense that that’s how it’s meant to be. The dean is meant to live here. Why would the campus have been created with a dean’s house, if the dean was not meant to live in the dean’s house? I talked to my wife, Monica, and she got it. Our children were a lot more skeptical. But they’ve had a blast, because it’s more private than we thought. It’s not like being a [House] master. My good friend Rakesh Khurana became master of Cabot House about the same time that I became dean. Their experience in terms of how integrated their lives are with their students is so much more than ours. But it has got this amazing value to me, that every day, just walking around this campus, I’ll have 10 to 20, 30-second to two-minute conversations. It gives you a pulse of what’s going on. You can do things that you would never otherwise think of doing. Like, if there’s a student show, or if there are student club events, or there are things on weekends, you can just easily come in and out, because you don’t have to drive in, and it doesn’t feel like a trip. It just feels like you can fit things into your daily life. The kids have enjoyed being close to Harvard Square and being closer to the city. It’s all turned out to be wonderful. 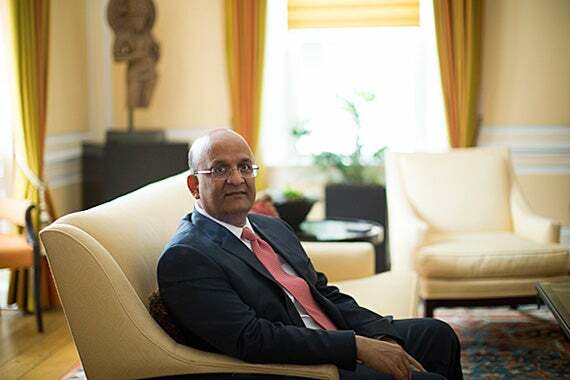 Nohria credited his predecessor for initiating efforts to tackle gender inequalities at HBS. Q: You’re a popular and respected teacher, and you’ve taught across the entire School and the University. To what do you attribute your success and which strategies have you found that work for you or that people most respond to? A: I used to teach a subject that was considered a soft subject. I taught leadership; I taught organizational behavior. These are things that people say, “Oh, you know, you show up to class, and whatever you say goes, and these are fluffy.” So I actually learned that you have to be demanding of students. In the end, if you’re not demanding of your students, they won’t respect either you or your subject. I have learned that if you can hold those two thoughts simultaneously in your head — that I want to be demanding of my students, but I want to be deeply caring of them, and I care about their learning, I care that they learn something from this class in a way that makes them feel better about themselves and better prepared to do things — they will respond to that in amazing ways. Q: Your public efforts to confront and correct what many women say is a deep history of gender inequalities and discrimination at HBS, both at the student and faculty levels, have drawn a lot of attention. How did you become sensitized to this issue and why has it been such a priority for you? A: Actually, many of these efforts began before me. The one that is the most vivid moment that shaped it for me was a conversation that occurred during my predecessor Jay Light’s time. There was a faculty meeting in which we were voting academic degrees, which is a pro forma faculty meeting that we have every year. We vote on all the names for first-year honors, second-year honors, and Baker Scholars. That’s the standard meeting. This time, as opposed to the vote just being pro forma, one of my colleagues raised her hand and said, “I’ve been looking at this list, and I can’t tell — what is the gender composition of the honors that we just awarded to these students?” The striking thing was that nobody had actually checked. We had celebrated for many years the growing number of women who had joined Harvard Business School, but we’d never asked an obvious question: How well do they do? What we discovered was that for many years, the proportion of women getting honors had lagged their representation in the program. We looked at that data carefully, and we said no, our women students have the same GPAs, they come from equally high-quality colleges, they have the same GMAT scores, and yet they perform not as well. What’s going on? I was in the job, at that time, of the senior associate dean of faculty appointments at Harvard Business School. So my colleague Peter Tufano and I did an analysis of how we were doing in terms of promoting women. What we discovered is that as we had begun to hire more women into the faculty, the proportion who were succeeding was diminishing slightly. When we had fewer women, they were succeeding at the same rate. But when we were having more women join the faculty, they were not succeeding at the same rate as the men. We looked at the women faculty at the entry level, and again, they all came from the same elite schools. They published as many papers. So they should have an academic track record where their odds of success should be the same. The same questions, I think, arise when we look at our women graduates in the workforce; we know, over time, that the way they sustain professional careers is different than men. In all these domains, I think it’s important for us to better understand what is holding people back. What are the forms that unconscious or structural biases take? How do we begin to attack that? How can we try and learn from trying to address these issues ourselves? These things have to be identified and attacked, I think, more with scalpels than with sledgehammers. We’ve learned how to do that on the student front. We’re thinking hard about how to do that better on the faculty front. My hope is that by learning how to create genuine equality when it comes to gender, we’ll also learn how to do it around race and ethnicity and sexual preferences or orientation and all of those other dimensions of diversity that are no less important, where there’s also evidence of systematic bias or unconscious bias. We’ve made some progress, and I’m very proud of the progress that we’ve made as an institution. But there is more work to do. This is deeply important to me because of my own experience. I found Harvard Business School to be a place where I never felt I couldn’t thrive because I was Indian or because I didn’t look like the majority. Quite the contrary: I became dean. It’s the most remarkable commitment to meritocracy I know, that a person like me would be dean of this institution. So the fact that we have people at HBS we can’t look in the eye and promise an equal opportunity to be as successful as anybody else is just deeply troubling to me, and we’re beginning to attack it as best we can. Q: I think there was some surprise that you laid out such an ambitious agenda for change shortly after you took over as dean and then pushed forward with it quite promptly. What drove you to take such a bold approach? Do you think that was the right call or is it too soon to say? A: I don’t know who said it, but someone much wiser than me once said that it takes as much to do something big as it does to do something small, so you might as well do something big. In institutions like ours, even making a small change takes a lot of work and effort. So if you’re going to do it, you might as well try to do it with some real conviction. And especially on an issue like inclusion, you have to break through the suspicion of whether you really are committed to change. I realized it was a huge thing even to make the issues openly discussable, and to admit to them. We saw our alumni react in all manner of ways about having Harvard Business School written up in The New York Times, from denial (“This is not the school that I went to”) to relief (“Finally, the school is admitting what it was really like”). So I’ve learned you’re going to get brickbats and you’re going to get bravos. You can’t worry about either. You have to believe that what you’re trying to do is deeply important, and important from a principle standpoint. If you stay true to that, it’s easier to make progress. Q: In her 2014 Class Day speech, Sheryl Sandberg recalled how as an undergrad at the College, they roundly booed the HBS students during Commencement because they were seen as “sellouts.” Obviously, she said this in good humor, since she’s also an HBS graduate, but there has been a widely held perception of business school students generally as motivated primarily by their own financial interests. Why do you believe the School has a responsibility to develop competent and ethical leaders and is that need more urgent now than a generation ago? A: Harvard Business School was founded in 1908 at the end of a financial crisis. Business was in disrepute, and business leaders were called robber barons. So the first mission statement of the School was to educate leaders who could make a decent profit decently — people who society could trust to do their job as business leaders. Because in the end, the job of a businessperson is to run a successful enterprise, which means a profitable enterprise. But that was not incompatible with doing it ethically and decently and in a way that was seen by people as people who could be trusted as any other citizen of the world could be trusted. Throughout our 100-year history, there have been times when that has been more and less salient. Today, as we enter our second century, our commitment to developing leaders not just with competence but also with character is one that we should take very, very seriously — one we should be very deeply invested in, because that’s what society expects of us. Q: Have you experienced any pushback on that mission? A: There’s always a small group of people who say that “the boundary of business is set by the law.” I think that the importance of business to the well-being of society is now so large, and business ideas are penetrating into fields that were historically not even in the realm of business. Take social enterprise, as a great example, and how many of our students both come from social enterprise and are now engaged in social enterprise. People are talking about the triple bottom line impact of business, or that the 1,000 largest business organizations in the world influence roughly 40 percent of humanity in some way, shape, or form. Business is too important to the prosperity and well-being of society for business leaders to not have a deep sense of how they can conduct themselves in a way that genuinely advances the well-being of the world. Because it’s worth recognizing that the ability to operate a business with the freedoms that we have is given to us by society. There are many societies in which businesses are shut down. The public sector takes over everything. So to enjoy these freedoms, one must have a commensurate sense of responsibility. With freedom comes responsibility, otherwise the freedom gets taken away. Q: How will you know if your leadership here, both as a teacher and as an administrator, was successful? A: I find reunions at Harvard Business School particularly compelling moments. Because in many ways, when people come and talk about what the School meant to them and how it helped change their lives, I know that’s not the product of what I’ve done. That’s the product of what previous deans and previous generations of faculty at Harvard Business School have done that we benefit from. My hope is that future alumni will have even better stories to tell about what they got from Harvard Business School. That’s one measure — that we continue to produce alumni who will look back at their time at Harvard Business School and think about the arc of their lives and what they’ve been able to accomplish as having been deeply influenced by the time that they spent here. But no less importantly: Did we influence the field of management education? The intellectual capital of Harvard Business School has been a benchmark for many other business schools to emulate and follow. We are experienced as a leader not just by our alumni, but also by the field. That is another type of leadership position that I hope we will have strengthened during my time as dean. I do think that in some ways, the real measure is 20 years later. It’s not in five years. There’s no real scorecard in five years that you can feel. Q: Have you thought about what you’d like to do after this stage of your career? Where do you see yourself in, say, 10 or 15 years? A: I don’t know. I’ve always thought that in any senior leadership job, some number from eight to 12 years is the right length. Any leader who overstays that better do so with some real confidence that they’re continuing to add value to the organization. It’s not easy to have either the energy or the vision or the capacity to constantly reinvent yourself, and therefore an institution, over an extended period of time. You know, I have no idea. I do hope that I will find a way to either return to being a professor and teach, which I miss deeply, [or] maybe actually try my hand at business. But I haven’t given it much thought yet. I’m just enjoying what I’m doing too much.